Here is a new take on an old favourite. Hark! The Herald Angels Sing is arranged in a jazzy swing style for accapella SATB choir. 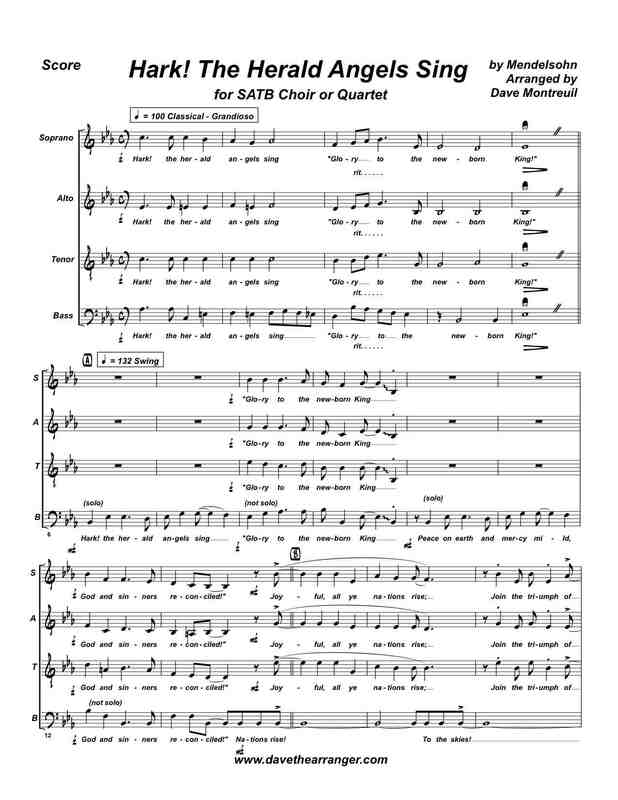 Happy, strong, up-beat and confident all come to mind when describing this SATB Choir piece. Finger snapping on '2' & '4' would be the perfect accompaniement to this arrangement. Hark! The Herald Angels Sing for Choir has a top note of Eb near the top of the treble clef for soprano, and an Eb an octave lower for the tenors. The basses have a top note of C above the bass clef, and go down to a G at the bottom of the bass clef (with an optional last note of low Eb, that can be taken an octave up). This arrangement is reworking of my brass quartet arrangement. I am really curious to know how this one works out, and I would like to hear a finished product, if possible! In fact, I would love to put a real recording of this one up, so let me know if you can record it! And feel free to let me know what you think. I added a few words to fill in some musical spaces - a couple of 'Hallelujahs' and a few other lines to make sense of the musical lines. Hopefully they don't seem too out of place.